The Chesapeake Bay Watershed is the largest estuary in North America, covering more than 400,000 acres of land and an incredible diversity of streams, creeks, rivers, swamps, tidal marshes, mud flats, and beaches. The watershed provides important habitats for fish, shellfish, reptiles, birds, mammals, and other wildlife. Throughout the Chesapeake Bay watershed, small streams provide critical habitat. A variety of stream types occur in the Highlands, Eastern Piedmont, and Coastal Plain regions. Streams contain an incredible diversity of native and non-native fish species, including brook trout, brown trout, rainbow trout, blacknose dace, bluntnose minnow, creek chub, golden shiner, bluegill, green sunfish, pumpkinseed, redbreast sunfish, largemouth bass, black crappie, flier, tessellated darter, sea lamprey, central stoneroller, comely shiner, common shiner, fallfish, ironcolor shiner, blue ridge sculpin, mottled sculpin, banded darter, shield darter, and swamp darter. In addition to sustaining populations of fish, streams support crustaceans, insects, amphibians, reptiles, birds, aquatic mammals, and other wildlife. At the head of the watershed is the Susquehanna River, one of North America’s largest rivers. Below the Conowingo Dam, the river empties into the Chesapeake Bay in an area known as the Susquehanna Flats. The Chesapeake Bay passes thru Maryland and Virginia before converging with the Atlantic Ocean. The upper bay provides a major spawning area for striped bass (rockfish), one of the most important sport and food fish of the USA east coast. Several of its rivers provide critical spawning areas for American shad, hickory shad, river herring, white perch, and other anadromous species. The middle and lower bay regions are important areas for saltwater fish, blue crabs, oysters, and other marine life. 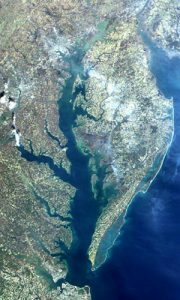 The middle bay receives water from several major rivers including the Patuxent, Potomac, Choptank, Nanticoke, and others. Along the lower bay’s western shore is the Northern Neck, Middle Neck, Lower Peninsula, and Hampton Roads regions which include the Rappahannock, York, James, Elizabeth, and Nansemond rivers. At its mouth, the Chesapeake disperses an enormous volume of nutrients into the Atlantic Ocean.